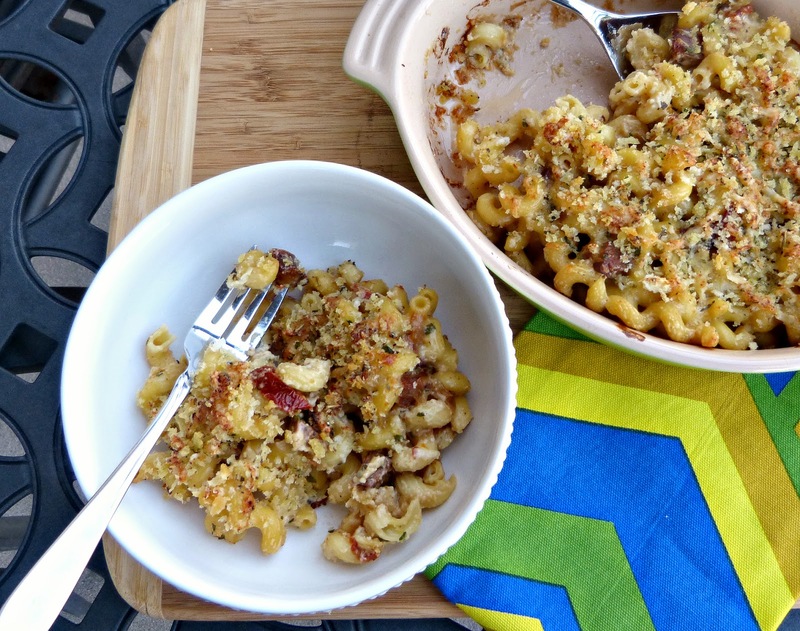 This Italian version of mac and cheese is the ultimate comfort food-- creamy inside, crunchy on top, cheesy, and packed with flavorful add-ins that give it some elevated Italian flair. Last week I rounded up a few great recipes to serve if you're planning on hosting a Super Bowl party this weekend. Today I have one last new recipe to add to the bunch-- and this a good one! 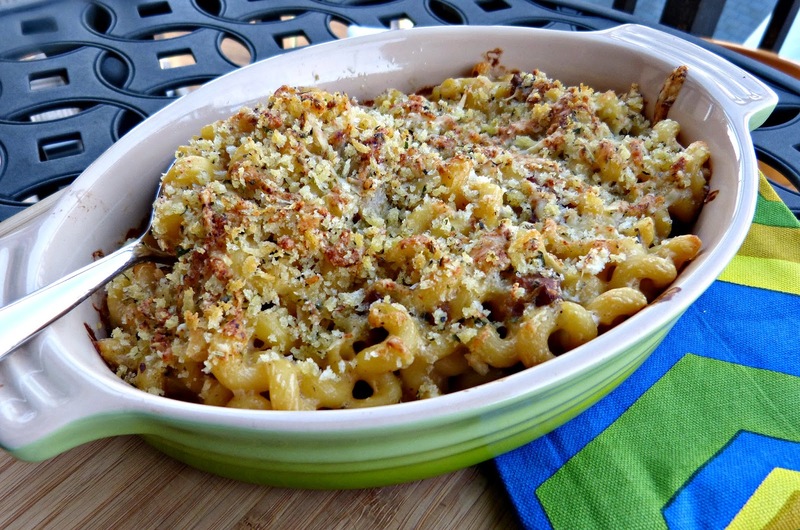 I love a good mac and cheese and a big batch of it is the perfect cheesy food to serve to a crowd of game watchers. And it's perfect for making ahead too! Make and bake it a day or two before the big game and then just pop it into the oven to warm up and serve to your guests. In this version, three deliciously different Italian cheeses -- nutty Parmesan, creamy fontina, and funky Gorgonzola-- are melted together into a perfect cheesy sauce. That sauce is combined with tons of freshly cooked pasta, diced Italian chicken sausage, sweet caramelized onions, and tangy sun dried tomatoes. 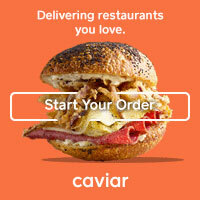 That mixture is topped with an herbed panko and cheese combination to create a flavorful crunchy crust. 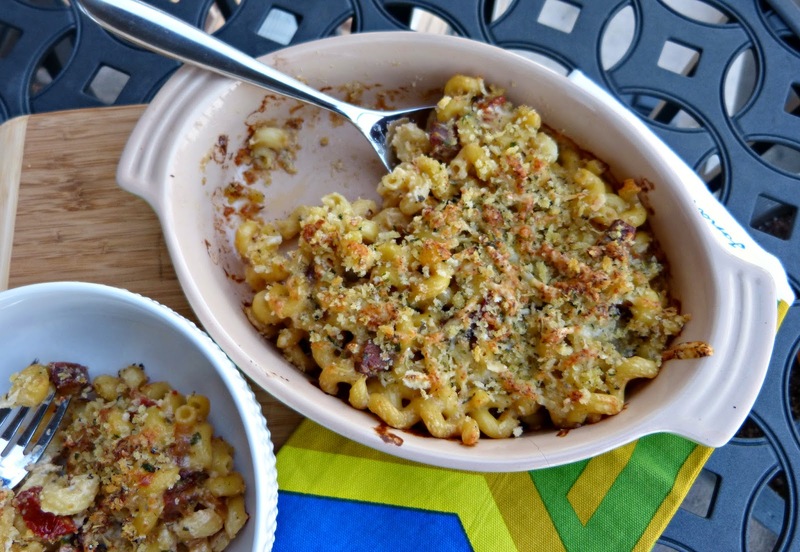 All of that together = mac and cheese perfection. As I mentioned previously, this decadent dish is a great addition to your Super Bowl spread. This is also a great dish to make for sharing too. One of my girlfriends just had a baby-- okay, "just" is not totally accurate as she gave birth at the end of October and it has taken me this long to finally make it over to see her and meet her adorable son-- and she's a big mac and cheese lover. So, I brought a pan of Italian mac & cheese with me to visit so that she'll have a dinner ready to come home to now that she's heading back to work. This is an easy and impressive dish to bring to any new mom or other friend in need of a convenient dinner. This recipe will easily fit an 9X13 baking dish. I split it up and made one 8x8 pan for my friends and an additional smaller casserole for us to enjoy too. This would also be perfect divided among individual crocks as well. Preheat oven to 450 degrees. Lightly grease a 9x13 baking dish (or a combination of smaller baking dishes, if you choose). Heat 1 1/2 Tbs. olive oil in a saute pan over medium heat. Add onions and a pinch of salt, stirring occasionally. If onions begin sticking to the pan or browning too quickly, reduce heat to medium low and add a little chicken broth to the pan. Continue this process for about 30 minutes until onions are golden and very soft. Add the chicken sausage and red pepper flakes to the pan and saute for 6-8 minutes, stirring frequently. When sausage is browned, remove from heat and stir in sun dried tomatoes. In the same pot in which you cooked the pasta, whisk together milk, broth, and flour. Bring to a boil and then reduce to medium. Cook for about 10 minutes, whisking frequently until the mixture has reduced and thickened slightly. Remove from heat and stir in 1 3/4 cups fontina, 1/2 cup Parmesan, Gorgonzola, and parsley. Stir until smooth and combined. Fold in cooked pasta until coated evenly with the cheese sauce. Add the sausage, onion, and tomato mixture and fold until just combined. Pour into a prepared baking dish. In a small bowl, combine remaining 1 1/2 Tbs. olive oil, fontina, Parmesan, panko, and Italian seasoning. Stir to combine and the sprinkle evenly over the pasta mixture in the baking dish. Bale for 20 minutes and until golden brown on top. Remove from oven and let stand 5 minutes before serving. 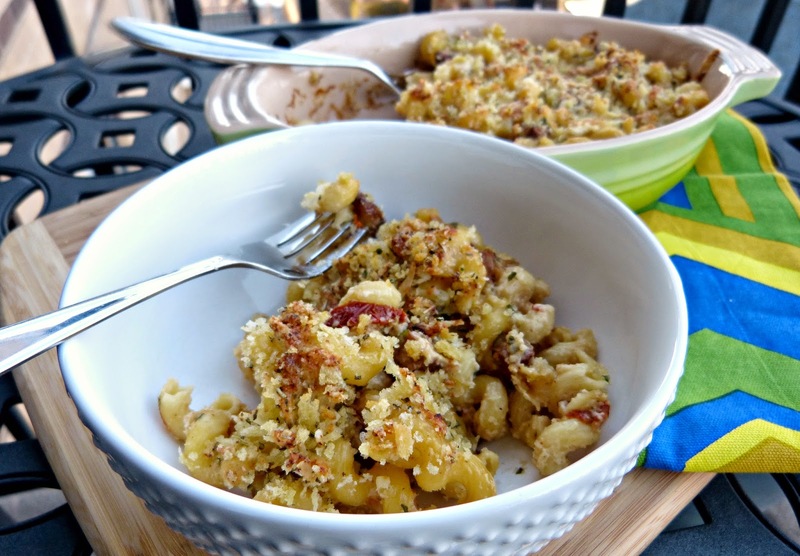 This is so yummy!Mac n Cheese has always been my favourite, this is so delightful.I loved that you gave such detailed directions,and you made it so easy to understand.